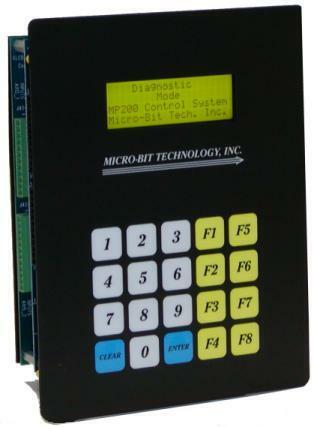 The MP200 Controller is designed with many special features and capabilities. The operator interface panel makes it easy to interact with the operator and provides on time information to the operator. The engineer can design and debug a program in a minimal period of time. The unit is designed to be flush mounted in a panel. The front panel is a sealed unit consisting of a 4 X 20 character display and 4 X 5 tactile feedback keyboard. The MP200 can be used as either an intelligent Operator Interface to communicate via RS232/RS485 to many devices such as PLCs, Motor Controllers, etc. or with the use of the real world I/O's it can control many types of industrial equipment.